One of my new projects this year is to work on repurposing more leftovers into lunches to make sure they are eaten! The other night, I made a BBQ Beef meal with stuffing (saw it on the stuffing box, thought it sounded interesting). The kids liked it a lot better than I did, so I was able to turn it into lunch this week. Faith has big scoop of the leftover beef, accented with the elephant pick, some herb cheese chunks, crackers, grapes, and some of our leftover pasta salad! I added a fork for the pasta salad and the kids said they scooped the beef onto the crackers too. 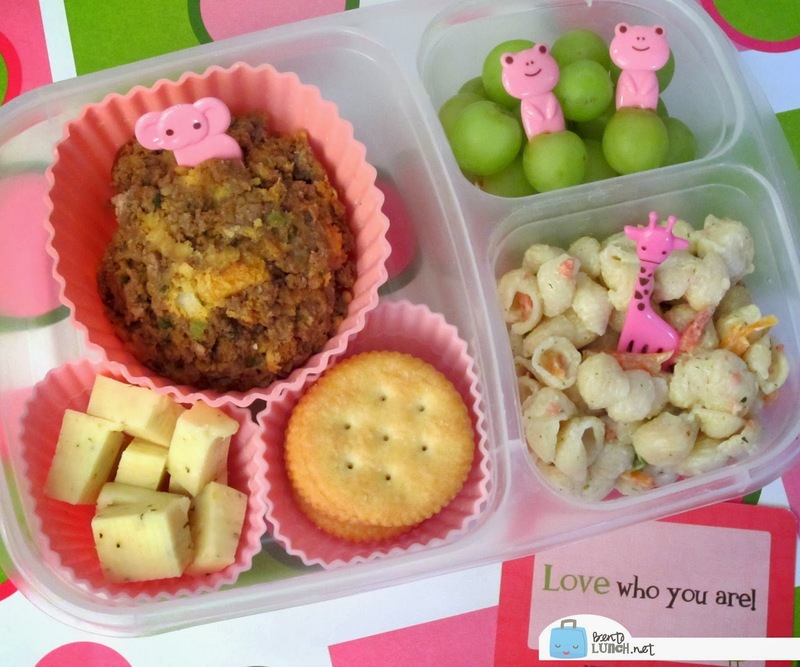 Lunch is packed in our Easy Lunchboxes. The silicone cup is the 4 inch ones by Casabella that touch the lid of the lunchbox, so no spilling! And of course, we added a Lunchbox Love card.